Researching psychological interventions is difficult due to the complexity of the treatment package and difficulty in standardisation of interventions. There is no 'placebo' intervention for psychotherapy and all control interventions will have some 'active' components, particularly in schizophrenia where psychosocial inputs are part and parcel of standard care. There is evidence from the literature that such active placebos reduce the effect size of the control intervention (Quitkin, 1999). Despite the above disadvantages, it is clear that psychological interventions in schizophrenia have evidence of effectiveness in clinical practice. Of note is that different therapies target patients in different phases of the illness. Family therapy and psychoeducational approaches appear to reduce relapse and offer good engagement points during crisis. Pure behavioural approaches seem to have more evidence in the area of deficit symptoms. Cognitive behaviour therapy appears to be useful in the presence of residual positive and negative symptoms, poor compliance and lack of insight. Most therapies have arisen from work done in specialist therapy settings or by specialist therapists. However, the recent trend, at least with cognitive behaviour therapy, is to provide this through therapists based in the community mental health teams. We may be heading towards a unified approach to psychosis. There is early evidence supporting the pragmatic combination of therapy approaches in a well-formulated manner. 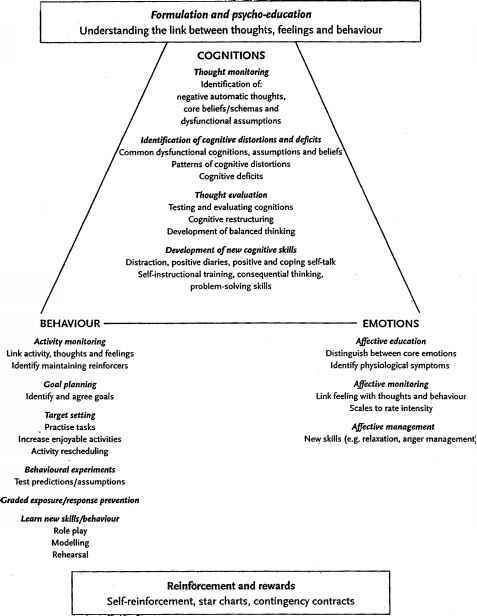 Cognitive behaviour therapy and family therapy combination certainly have value (Sellwood et al., 2001). Moreover, family therapy in schizophrenia has several behavioural coping strategies and problem-solving components, which are also a part of the CBT approach (Tarrier & Wykes, 2004). Similarly psychoeducation can be a part of several types of intervention. Substance misuse is a rising cause of co-morbidity in severe mental illness (Crome & Myton, 2004) with not enough evidence for effective approaches to treatment (Jeffery, 2004). Research is needed in this area as also in helping patients with other co-morbidities including personality disorder, and posttraumatic stress disorder. With the high incidence of depression and completed suicide in psychosis the future direction in psychological therapies needs to address these issues as a part of comprehensive and balanced management of psychosis. Furthermore research on matching psychological intervention to clients' clinical and social needs is appropriate and timely. The current treatment of psychosis is based on the case management model. However, there is no evidence that increasing the intensity of care will provide better outcomes (Burns et al., 2002). A more therapeutic or recovery-based model is appropriate (Roberts & Wolfson, 2004). Current mental health training programmes do not offer sufficient skills training to provide psychological interventions in psychosis. Considering the fact that management of psychosis is core business of mental health teams, it is important to address this lacuna. Apart from research, more lobbying is needed to include skills early in the training (Turkington & McKenna, 2003) rather than provide it as an optional follow-on specialised training model.